The P1000 MBE system is a cluster tool based fully automated production MBE system. The wafer transfer is based on a UHV central distribution chamber (CDC) which allows automatic processing of a batch of 40 (4”) wafers. 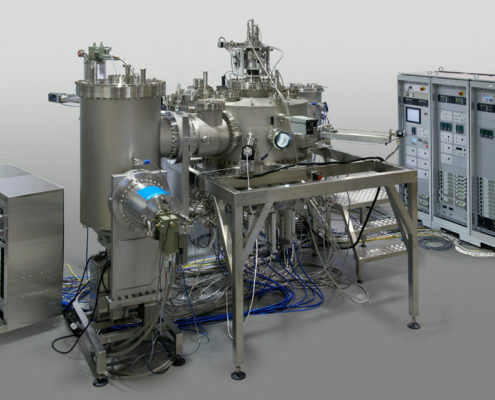 The CDC has connection ports for a second growth chamber, cassette load lock, UHV storage chamber and high temperature outgassing and hydrogen clean chambers. The P1000 growth chamber has been designed for long growth runs and easy service and maintenance. The growth chamber has a removable source flange. This allows splitting the chamber in to two parts for thorough cleaning of the cryo panels from deposits. 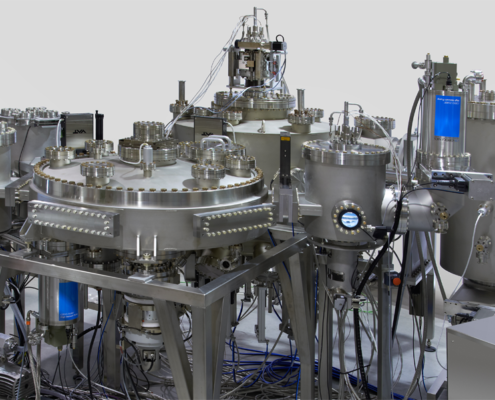 The two part cryo panel system has the largest possible area of liquid nitrogen cooled surfaces for efficient group V material pumping.